First of all, I have been searching on the web and I have found similar cases but nothing useful for my problem, and more over, I'm pretty new in LaTeX. If I take off the numbers from \section, then, numbering of subsections are equal in every section (this is in the Content itself). 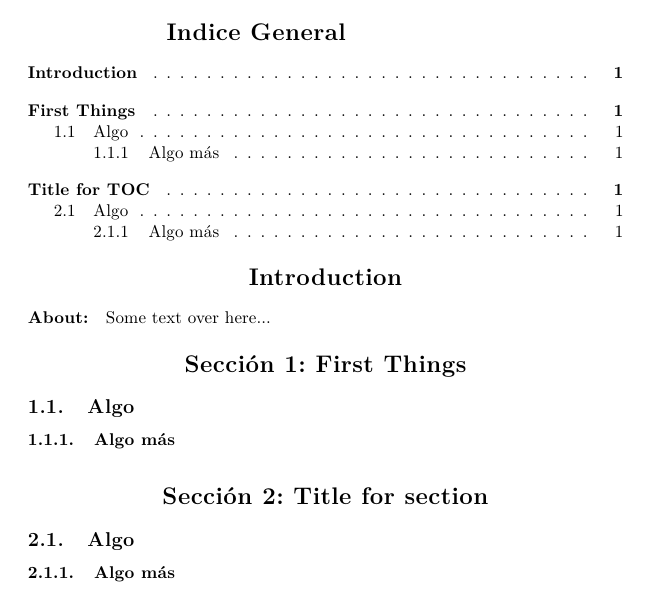 I need to get sections without numbers neither in the title nor in the TOC, but \subsection and \subsubsection must have that numeration. 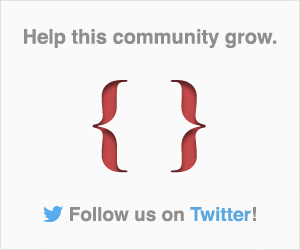 Get aligned sections in TOC. 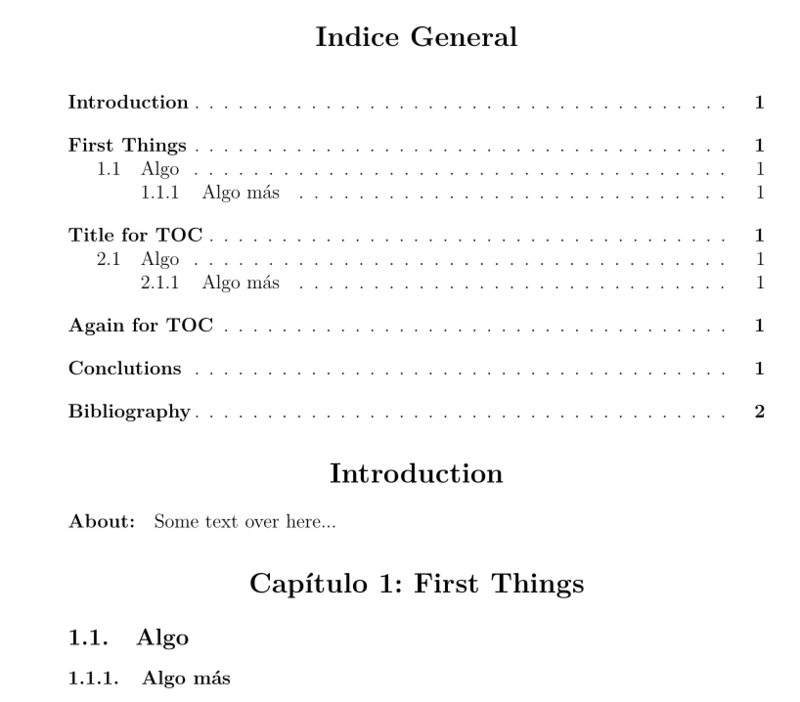 I wouldn't recommend to hardcode something like "Capítulo 1: First Things" in a sectional heading. The following code looks a little bulky because it does a more than you requested, but it induces a more LaTeXnish manuscript file. You can use the package titletoc instead of tocloft to achieve what you want. As per your comment, to have Roman numerals for sections in the TOC (although I don't approve this choice), do the following. In this case it is better to use tocloft instead of titletoc. Note that the spacing between Roman numerals and titles is deliberately large so to leave space for large numerals. Not the answer you're looking for? Browse other questions tagged table-of-contents sectioning titlesec tocloft or ask your own question. 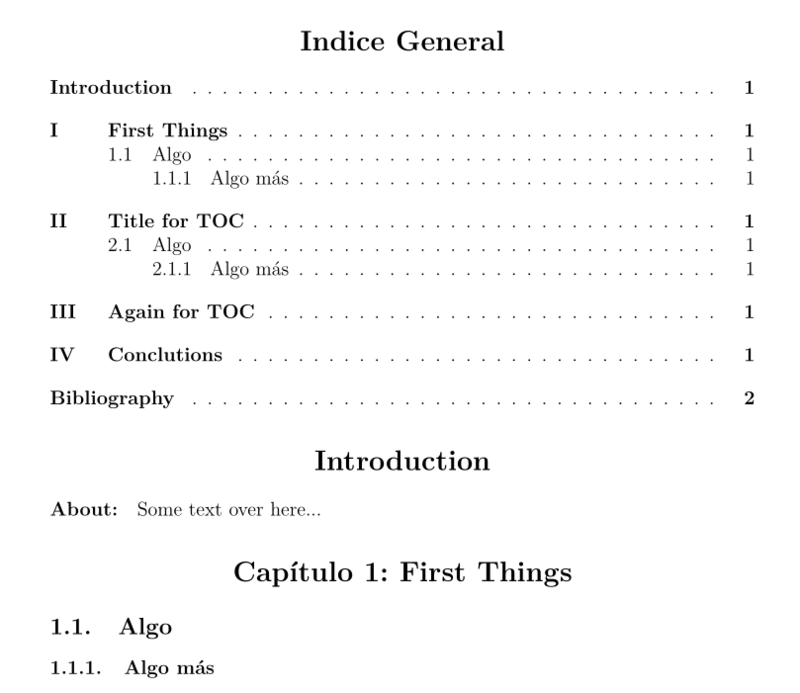 Fine-grained control of sectioning numbers displayed in TOC?